Thanks so much to Jenny for the chance to be a guest here on her blog! My blog is Dinner with Denise. I began the blog because I am a believer in bringing people together around the table to enjoy a meal and get to know one another. Often, people ask for recipes and it is nice to have a place to share those with my guests and with others around the world that may stumble across my blog. I live in Fort Collins, a small city about 45 minutes away from where Jenny has been going to school. I love how we have many of the amenities of a city with a small town feel. Anytime I am out and about here, especially in Old Town, I am greeted by many people I know. I love getting to know people and making connections. One of my favorite ways to do this is through inviting people to come share a meal around my table. I think it makes people feel good to be included and to be served a meal they can enjoy while getting to know one another. This is especially true at the holidays. I like to gather family and friends, old and new as well as people I don’t even know to have Christmas or Thanksgiving dinner. This year will have around 20 people which will be one of the biggest groups for Christmas at my house. Even though there may be lots of people, I really want the food to taste great. Denise’s grandson helping out in the kitchen! The recipe I am sharing with you today is one I often serve at holiday meals because people seem to really like and often ask for the recipe. It is a slightly different way to serve sweet potatoes with apples and pecans in a crunchy topping. I was first introduced to a very different version of this recipe as a teenager from my great aunt. Originally, it called for canned products but I now use fresh yams and apples. The crust changed too and I added the pecans on top. This is really easy to make and much of it can be done ahead of time, making it ideal for serving a crowd. If you are really feeling the time crunch, you could use a can of apple pie filling instead of the fresh apples. 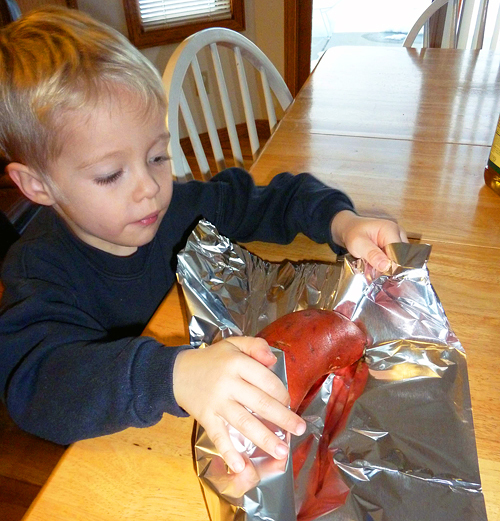 To prepare fresh sweet potatoes, wash and bake in foil at 375F until soft (about 50 minutes. Let them cool. 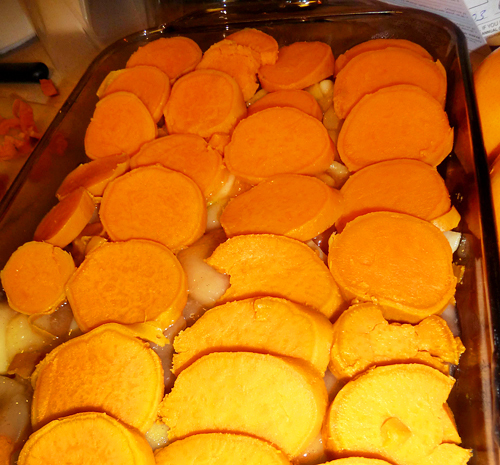 While yams are cooling, peel and slice the apples and heat a bit of butter in a shallow pan. 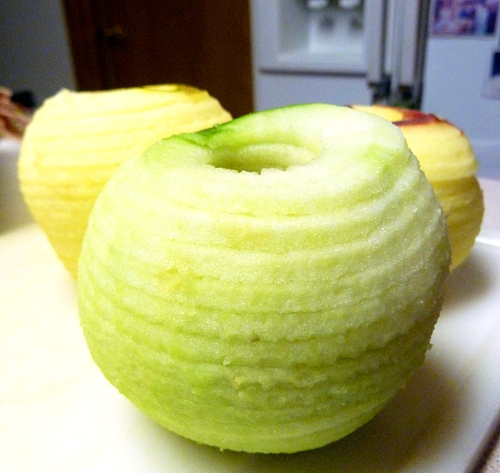 Cook apples over low to medium heat till they begin to soften. Add sugar and spice mix; continue to cook for several minutes to caramelize a bit. While the apples cook, prepare topping; Blend sugar, spices and flour in medium bowl. Using two knives or a pastry cutter, cut in cold butter. (Do not over mix butter. Just blend until mixture begins to resemble dry oatmeal.) Add in ginger snaps if using. Peel and slice sweet potatoes into medium thick slices. Place about half in one layer on the bottom of a 9 x 13 baking dish or a large, deep 2½ quart casserole. Next layer apples. Top with the other half of the sweet potato. 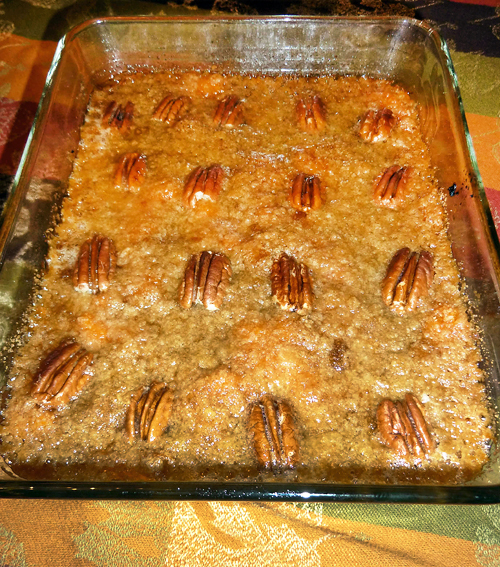 Place whole pecans on half or whole casserole. Bake at 375F uncovered, until casserole is bubbly and topping is crisp (about 35 minutes). Serve as soon as possible. To make ahead, you can prep sweet potatoes and apples. Layer them in a pan and cover with foil. Refrigerate. Topping can be made an hour or so before and sprinkled over before baking. Thanks again, Jenny for letting me guest post here on your wonderful blog. Congrats on graduating and best of luck in the future! Thanks so much Denise! This would be great for Christmas dinner! If you or somebody you know would like to be a part of Featured Foodie Friday please e-mail me at savourthesenses (at) gmail (dot) com and we can get you scheduled! 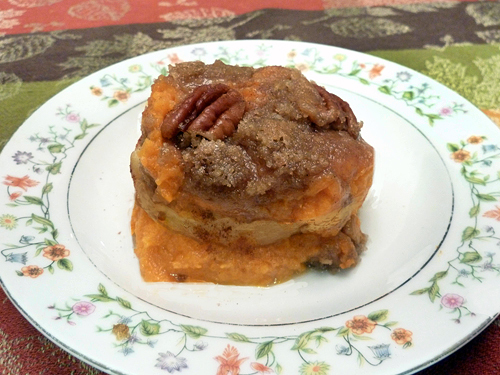 What an awesome sweet potato dish. I need to pin that one to remember this recipe! Thank you so much for having my guest post here! You have a wonderful blog! Merry Christmas and best wishes for your move and new life as a graduate.